Levine Music is a nonprofit community music school offering outstanding musical instruction for students of all ages, abilities and economic backgrounds while also encouraging a love of music, fostering creative expression and promoting personal enrichment. 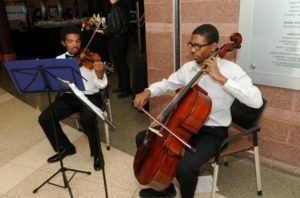 The School has four campuses: Sallie Mae Hall in Northwest, DC; Town Hall Education Arts & Recreation (THEARC) Campus in Southeast, DC; The Music Center at Strathmore Hall in North Bethesda, Maryland; and the Westover Baptist Church in Arlington Virginia. Our faculty of 150 world-class artists offers instruction in more than 20 instruments and voice as well as classes, in theory, history, composition, chamber music, and jazz ensembles and music technology. The School offers a performance calendar of extraordinary variety featuring more than 200 performances of faculty, students and guest artists throughout the year at its four campuses and at other prominent performance venues. Founded in 1976 in memory of dedicated amateur musician and prominent Washington attorney Selma M. Levine, the school has built its programs and reputation on two principles central to its mission: excellence and accessibility. To maintain the School’s commitment to accessibility, Levine offers an extensive scholarship program including outreach programs in some of Washington’s most neglected neighborhoods. This year, the School will provide free or subsidized music instruction to more than 850 students at a cost to Levine of more than $800,000. Learn More.